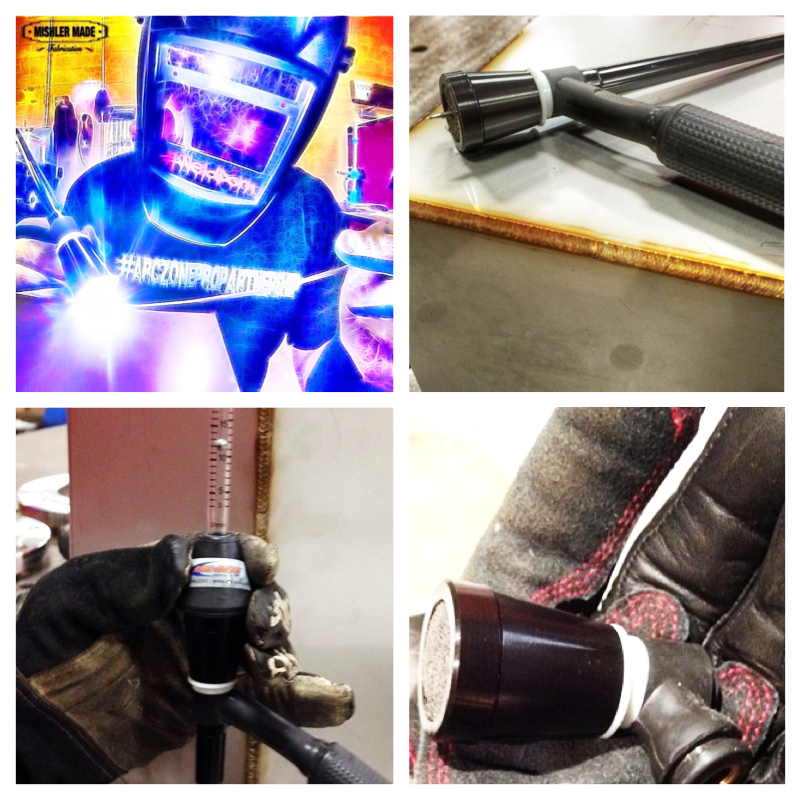 One of our most exciting finds has been the Vortex™ TIG Nozzle for TIG welding specialized materials. The nozzle kit comes with a gas diffuser bisket, which in addition to the wide nozzle, provides a larger umbrella of shield gas to minimize weld contamination from turbulence. I was introduced to the Vortex TIG nozzle by a racing friend, Mike Long, General Manager for Eagle Motorsports, one of the premier open wheel chassis manufacturers in the world. I met Mike back in 2003 at the Mopar Million Sprint Car race at Tony Stewart’s Eldora Speedway. I was there with my good friend, Jac Haudenschild, who won the event– the largest single payday in Sprint Car racing. The “Freedom Pedal” is the first product that Mike created for the welding industry (to my knowledge). 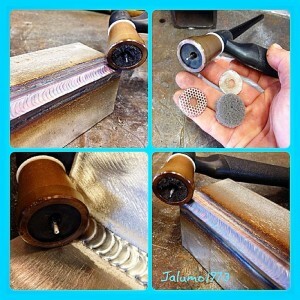 It was the first wireless foot control for TIG welding! This pedal can be used up to 100′ from the welding power source. I tested one of the original prototypes in the Arc-Zone Ultimate Weldshop and was impressed. He later sold that product to Lincoln Electric and went to work for Eagle Motorsports, where he encountered another common welding challenge — getting consistent shield gas coverage for out-of-position TIG welds on tubular race car chassis. He created the Vortex nozzle specifically for that application and then contacted Arc-Zone to see if we would help get it to market, so other fabricators could benefit from its performance. Needless to say, the Vortex has been a great addition to our line-up and an invaluable asset to many a fabricator’s tool kit. Our PRO Partner Wes Mishler was impressed with the durability of the Vortex welding nozzle itself. In his review he explained that he accidentally dropped the Vortex right out of the box and onto the concrete floor. “When I picked it up I expected it to be dented and at least the black finish to be chipped off [but] it was still in perfect condition! The anodized finish is tough,” he said. Arc-Zone PRO Partner Jason Moser was also impressed with the Vortex nozzle. “The nozzle performed flawlessly on thin stainless, sheet metal, and thin gauge aluminum….. I was definitely pleased with the appearance of the welds. I have pushed this thing to its limits and it has definitely found a place in my arsenal. The only limitation is, if you run too much amperage through it, the diffuser bisket will burn up , leaving you with a sad face, he says. If you do find yourself with a sad face, the Vortex Nozzle biskets are replaceable and not too expensive–$6.99 for a pack of three. For 9/20 & Series 2 TIG Torches, the Vortex™ TIG nozzles are used in conjunction with 45VXX series Gas Lens Collet Bodies (part number based on tungsten size). For 17/18/26 & Series 3 TIG Torches, the Vortex™ TIG nozzles are used in conjunction with Stubby Series Gas Lens Collet Bodies. If you want to see this nozzle in action, Wes Mishler posted a cool video on Instagram. 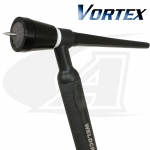 And to get the Vortex TIG nozzle into your own weld shop, order online at the Arc-Zone.com store, or give our customer service team a call (800-944-2243 toll free, or 760-931-1500 world wide). I’m sure you’ll be impressed with the Vortex too! What is the cost of the vortex nozzle and torch? With torches, there are so many options… but click here for a WP-9 torch option.